We interviewed Craig, Clem and dozens of other traders from the five continents on video, asking about their relationship with Guangzhou, the sellers, and other traders they may encounter. Traders come because they believe this city has the cheapest products available in the world. 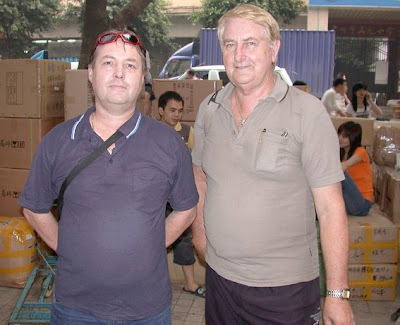 On this 2-3 week visit Craig and Clem will spend around A$100,000 (650,000RMB). They visit 3 times a year and have been coming here for 8 years. Before Guangzhou, they used to buy in Hong Kong and Taiwan. They tend to use the same sellers each year – regular customers should get a better price – until the seller does the wrong thing; like supply the wrong goods/quality, change the price, or leave goods behind so they miss the ship and have to be sent by plane instead (400 times dearer than ship). Clem says they will still pop in when there in town but and say “hello” – one of the few Chinese words that they know, other phrases being “too high”, “too low”, “how much”, “how many” – but won’t buy from them again. They say a lot of the Chinese they deal with speak some English, plus they have help from interpreters and guides. But even when they’re doing business with the sellers that don’t speak a word, they can find a way to understand, such as negotiating price through the use of calculators. Even though the community of traders is fragmented in time and place (and at times secretive), there are odd occasions when the network connects to exchange tips. Craig and Clem have only ever met one other Australian, but do bump into Americans – who usually get the better prices because they buy the largest amounts – and often put them on to things. Germans too! Because they are not competitors, it’s no skin off their nose. Craig remembers having a quick chat with a Middle Eastern guy at an airport baggage collection. Next minute the guy was on his laptop and getting him the address of a factory somewhere in China, which he said, has very good products at a very good price.